Chocolate Bunnies for the first 50 children visiting on Easter Sunday!! Just click	on our Calendar to see events. Despite the Brexit debate, we continue to welcome our European visitors and, responding to requests, have developed short leaflets on the history of the Castle. These can be seen on the education page. You can see a comment on the Guardian online from a fan of Portencross and a lovely Getty Image of the Castle. Click here to see. Expressions of interest for castle stewards has now been closed down. We would like to thank all those who expressed an interest in the post. We wish to recruit a Castle Steward. This is a seasonal, fixed term, part-time appointment, currently paying £8.87 per hour. The Castle is open from 11.00 to 4.00 every day during the summer and from 30th March to 15th April. It is also open for school holidays, weekends and public holidays to the end of September. You will share a rota with three other Stewards. Stewards are responsible for welcoming visitors and for ensuring the highest standards of health and safety. They also explain the castle layout and history to visitors, count visitor numbers, undertake occasional visitor surveys, assist with tidying/ cleaning, and carry out routine set-up and close-down procedures. Stewards also occasionally assist at special events. Stewards work alongside Castle Volunteers to ensure a good visitor experience and encourage donations and sales towards the Castle’s upkeep. Training will be provided. For further information and job description, or to arrange an informal visit, please contact Sinclair on 01294 829711 or Ann on 01294 823799. Cards are now available at West Kilbride Library or the Barony. You can also contact An on, 01294 823799 or by email at port_n_x@hotmail.com. The cards cost £5 for a pack of 10 or 60p individually. 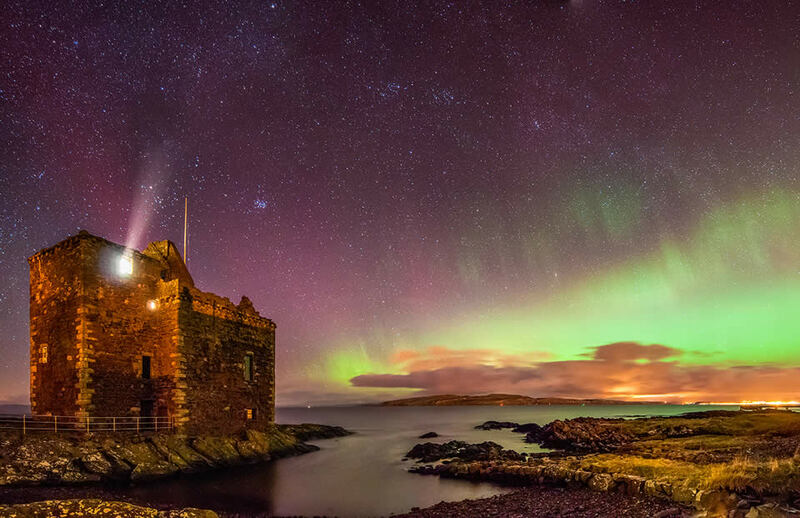 For the moment, limited numbers only of our Christmas card, 'The Milky Way over Portencross Castle', are available at West Kilbride Library. Unfortunately, our local printing firm suffered serious damage in recent bad weather and has to install a new press. We apologise if this causes any inconvenience. The printer hopes to be up and running again very soon and we shall keep you posted on progress with printing further stock. 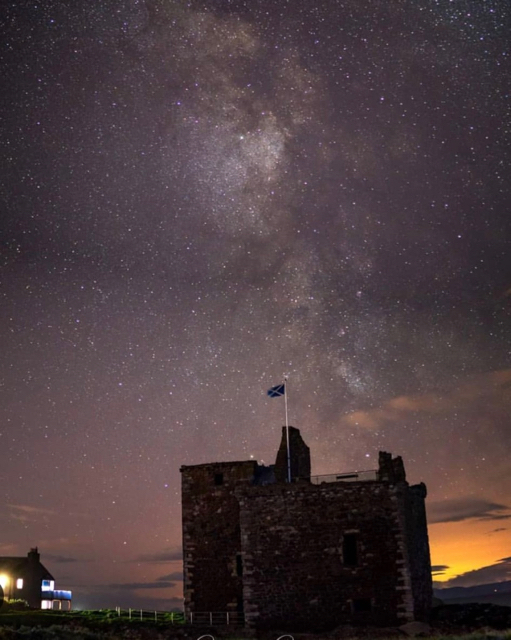 You can support the Castle again this year by buying our latest Christmas card, 'The Milky Way over Portencross Castle', from a photo by Chris Wright. Your first chance to buy cards will be at the Combined Charities Christmas sale in West Kilbride Village Hall on the morning of Saturday 27th October. Following that, they will be available at West Kilbride Library, or contact Ann, 01294 823799 or on port_n_x@hotmail.com. The cards cost £5 for a pack of 10 or 60p individually. Many thanks to Chris for allowing the use of his wonderful photograph. The Castle has now closed for the winter following a successful 2018 season. We had more than 8,000 visitors across the 2018 summer season. It is now time to seal up the windows and cover up the furniture to protect against the worst of the winter weather. Our heartfelt thanks to all who helped in every capacity - welcoming visitors, assisting at fund-raisers, housekeeping, maintaining things in good order, and all the other jobs needed to run a medieval building as a visitor attraction! Apart from the wonderful stewards, who are paid for their good services, all of this work is done on a voluntary basis. It is a true community effort. Thanks also to the enthusiastic visitors who, as usual, came from far and wide as well as up the road. The Castle will be open to visitors at weekends during September 2018. It will also be open Monday 24th September. All 11am until 4pm, with last entry 3.45. The Castle will be closed on Saturday 1st September 2018 for a private event. On Sunday 30th September, it will close down for the winter. Thanks to all who supported the recent 'Craft in the Garden' event, which raised a remarkable £1,415 for the funds. The annual Craft in the Garden event will take place on Saturday 11th and Sunday 12th August 2018 from 11.00am till 5.00pm on both days. Entry costs £1. A wide range of crafts will be on display and available for purchase. Demonstrations of Raku pottery techniques will take place on both days at 2.00pm. Tea, snacks and home baking will be available throughout. Free parking is available at Portencross car park. The event will be held in South Banks House garden which is situated 50 metres before the car park. You can, of course, visit Portencross Castle as well. Our Annual Art Sale passed off successfully, raising just under £2,000 for the Castle funds. Over 140 paintings and other artworks were exhibited, and 21 of those were sold. This event is very labour intensive, so huge thanks go to the many volunteers who: erected the hanging framework - in a difficult, but impressive, space; recorded the exhibits then carried them up the castle stairs; hung them to best advantage; and dealt with visitors and purchasers during the show. Further thanks are due to all those who contributed to the success of the tea tent by serving, baking, and erecting the marquee. The castle project is very fortunate to be supported by so many willing volunteers. 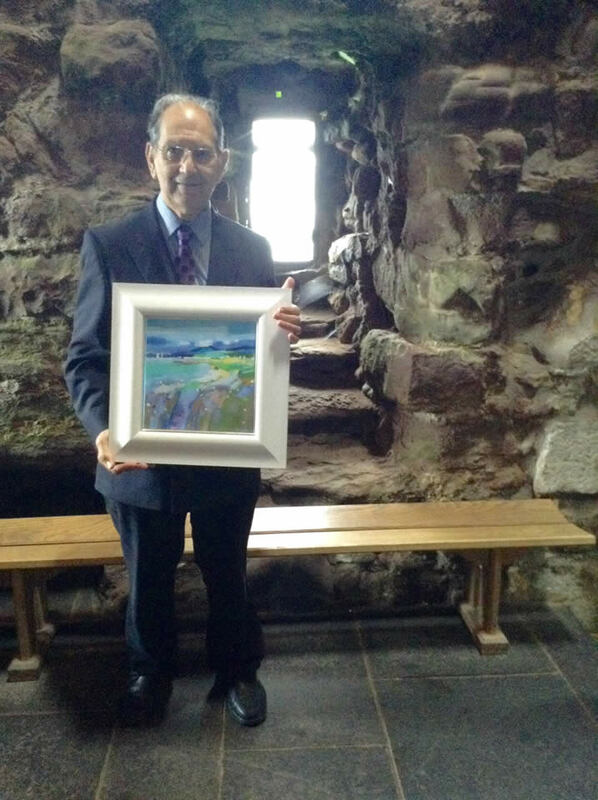 A successful raffle featured four donated artworks as prizes: two paintings of the Castle by Jane Molloy and Helen Fairclough; a stormy seascape by Chris Thomson; and a framed print by Pam Glennie titled 'Coastal Colour, towards Arran'. Many thanks to Jane, Helen, Chris and Pam for their donations. First prize went to Henry Kennedy-Skipton, with no 309. Finally, thanks to all the visitors who supported the event, and particular thanks to the artists, without whom there would be no show! The Castle is now open daily, 11.00am - 4.00pm, last entry 3.45pm. Entry is free. On the weekend of Saturday 23rd and Sunday 24th June, entry to the Castle will be restricted to the annual Art Sale. There will be an admission charge of £1 for adults, while children can enter free of charge. The Art Sale provides opportunities to view the work of local artists and to buy an original work of art at a reasonable price. Teas are available in the nearby garden of South Banks House. Add in a Portencross walk, and you could have a very pleasant few hours while supporting the Castle funds. Thanks in advance to participating artists, on whom the success of the show depends. 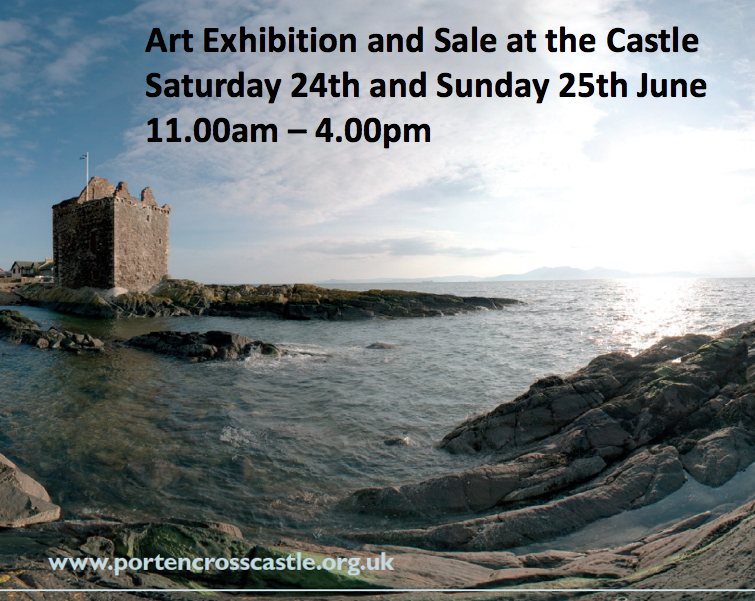 All proceeds to Portencross Castle management and maintenance. Instructions for artists can be seen by clicking here. The Castle will be open daily from Friday 30th March until Sunday 15th April. It will also be open daily from Saturday 30th June until Sunday 2nd September. Weekend openings will run from 30th March until 30th September when the Castle will close for the winter. It will be open on the holiday Mondays of 7th and 28th May. This year's Art Show will be held at the Castle on the weekend of 23rd and 24th June. Opening times are 11.00am – 4.00pm with last entry at 3.45pm. Admission is free but donations and fund raising help considerably in keeping the castle open, so all donations by visitors are gratefully accepted! Now that the countdown to Christmas has started please consider helping the castle funds by sending our Christmas card to family and friends this year. Pack of 10 for £5 available from West Kilbride library, the Barony Centre or from Ann McLachlan (01294 823799 or port_n_x@hotmail.com). The multi-charities Christmas card sale takes place in West Kilbride Village Hall on Saturday 28th October from 9.30am till 12.30pm. The museum team will be serving lovely cakes and tea or coffee for £3. Stay to mingle with friends and neighbours! An art show featuring work by local artists will be on display upstairs in the museum area. Entry to the art show is free and well worth the stair climb. PLEASE NOTE: The Castle is now closed for the winter except for special events and hires. From Saturday 1st July, the castle will be open daily until and including 3rd September. For the rest of September, the castle will open at weekends and on Monday 25th September which will be the last public opening day. Apologies	for	the	previous error in September dates. The annual Craft in the Graden exibition and sale will take place on Saturday 19th and Sunday 20th August 2017. There will be stalls displaying, demonstarating and selling craft and art works. All welcome. Tea, coffee and home baking is available and teh entry charge is £1.00. Cover will be provided by a marquee and gazebos. The recent exhibition and sale of art on Saturday 24th and Sunday 25th June at the Castle was attended by almost 300 adult visitors and many more children. The weather was dry but blustery that weekend. Artists provided us with 112 exhibits, of which 26 were sold. In total £1,346 was raised for the Castle funds. All proceeds from the sale will go towards the maintenance and running costs of the castle. The art exhibition and sale is a labour intensive event: we would like to thank all the volunteers who helped to erect the display system, take in and hang the exhibits, and attend to visitors. Thanks also to the artists who brought their work, without whom the event would not be possible. A huge thanks to Chris Thomson and Pam Glennie, who donated the raffle prizes. William Fitch had the first lucky ticket which was selected to win the raffle. He chose the Pam Glennie print. 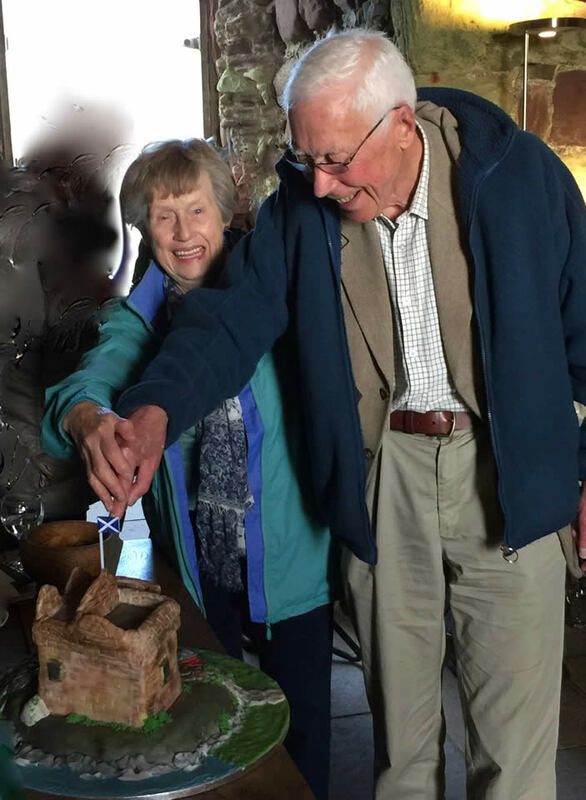 The winning raffle tickets were selected by the first visitors to the Castle when it reopened after the art sale. This year it was the Rev Alec Boyd and his wife Diana from Millport. Winning tickets were no 4 and no 172. 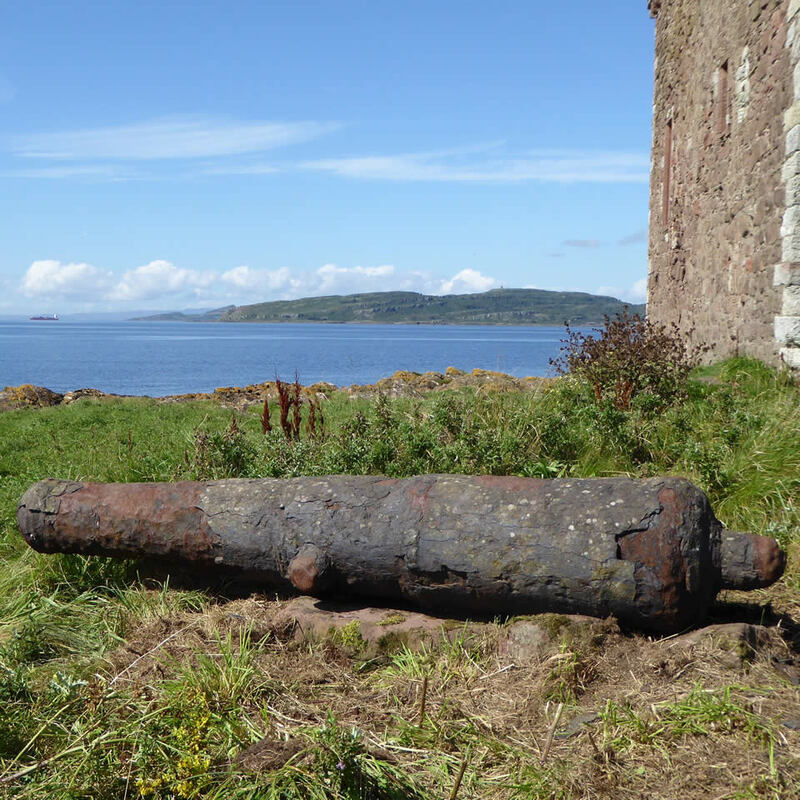 A visitor to Portencross discovered an interesting artefact at the harbour beside the Castle. 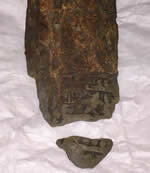 If anyone can identify what this artefact might be, please get in touch with us. The artefact is around 150mm long. FOPC members are continuing to research the 'find', including working with archeologists. We will keep you updated if anything of interest comes to light. From Saturday 1st July, the castle will be open daily until and including 3rd September. For the rest of September, the castle will open at weekends and on Monday 18th September. The last public opening day will be Sunday 24th September. The castle will then close for the winter except for venue hires and pre-arranged group tours. Occasionally during the summer season, the castle is closed for a private function. Any such events will be posted in advance on this website under News and Events to allow you to check in advance. A fund-rasing coffee morning was held from on 18th March 2017 at Southbanks House, Portencross. A modest entry fee covered the price of tea/coffee and home-made goodies. A raffle was held with lovely prizes and Portencross Castle mementos were on sale. A lot goes into opening up the castle after the winter. Apart from the usual dust and sand, some small pieces of debris seem to accumulate throughout the castle, including all the way up the spiral stairway. Gaps in the protective glass, which are covered up for the winter, are opened up again and the sealing material stored until next winter. Leaflets, booklets and other materials are unlocked from sealed containers and got ready for display. The television and video 'kiosk' are unearthed from their dry winter storage and restored to working order. Display panels are refreshed with a good dusting down. The flag and flagpole are checked to be in good condition. Professional electrical safety tests take place. And a good look around the castle fabric is undertaken. This year also involves a five-yearly inspection to make sure everything is safe and in order. A training session is held for volunteers and stewards to refresh memories and add new insights. Training this year will have an additional focus on the Portencross Cannon which has been moved back to it's old resting place just outside the castle. Our thanks go to the FOPC Board members, volunteers and stewards who come together get the castle ready for the 2017 season. Let's hope it is a record-breaker. Our Castle Christmas cards for 2016 are now available for purchase. They will go on sale at the Combined Charities Christmas Sale in West Kilbride Village Hall on Saturday 29th October, 10am - 12.30pm. The cards are priced at 60p each or £5 for pack of 10. After the Charities Sale, you can buy the cards in West Kilbride Library, or simply by phoning Ann on 01294 823799 or emailing her at port_n_x@hotmail.com. Portencross Castle is free to visit and is sustained through the generosity of charitable contributions. The sale of our Christmas cards are part of our fund-raising activities to maintain and develop the Castle as a local historical attraction and visitors' centre. Friends of Portencross Castle held a General Meeting in the Castle on Sunday 25th September 2016. Alastair Glen gave his report as chairperson. He stressed the tremendous success of the Castle in its six seasons of opening. Alastair reminded everyone present that this success had been due to the efforts of all those who had contributed. People had given generously of their time, organised fund raising activities, contributed financial support, and provided sound advice. Recent work on the Castle has been helped greatly by funding support from the May Lockhart Trust, the W M Mann Foundation, the Bottomly Family Trust and Historic Environment Scotland. Pauline Buckley gave her report as FOPC's Treasurer. While FOPC's financial position continued to look strong, all agreed that an appropriate reserve should be held as a contingency given the Castle's history and the potential need for future maintenance and development. Alastair reminded the meeting of the historical importance of the castle and the many twists and turns, threats and dangers, successes and accomplishments in its recent history. He stressed his pride and privilege in having played a part in this exciting journey. Alastair then announced his intention to retire as chairperson and outlined the process through which the FOPC Board would appoint a new Chairperson at its next meeting. Ann McLachlan thanked Alastair for his enormous contribution to the success of the Castle project. 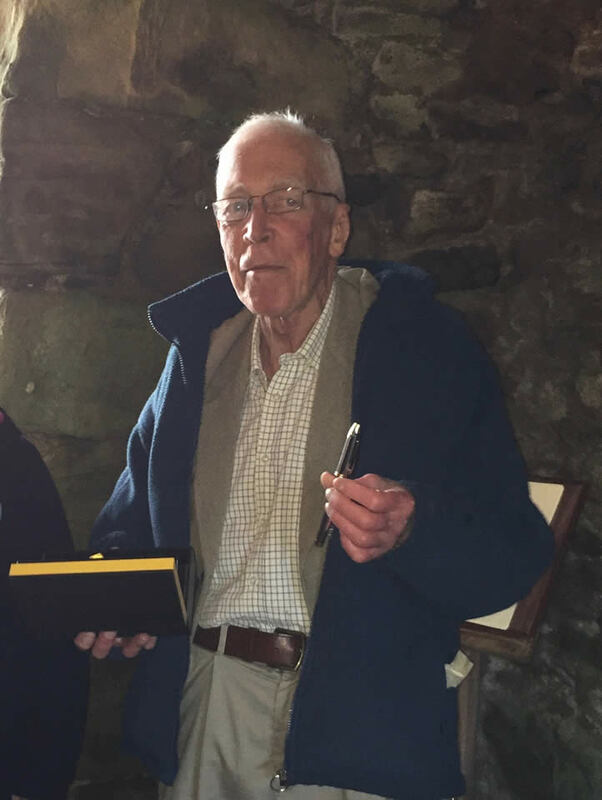 Over a considerable period and in the face of many hurdles, Alastair had guided the FOPC Board and its supporters to successfully open the Castle as a visitors' centre and historical attraction. It was in no small part, Ann reminded the meeting, due to Alastair's enthusiasm, determination and resilience. In gratitude for his contribution, Ann presented Alastair with a personal gift donated by FOPC Board members. 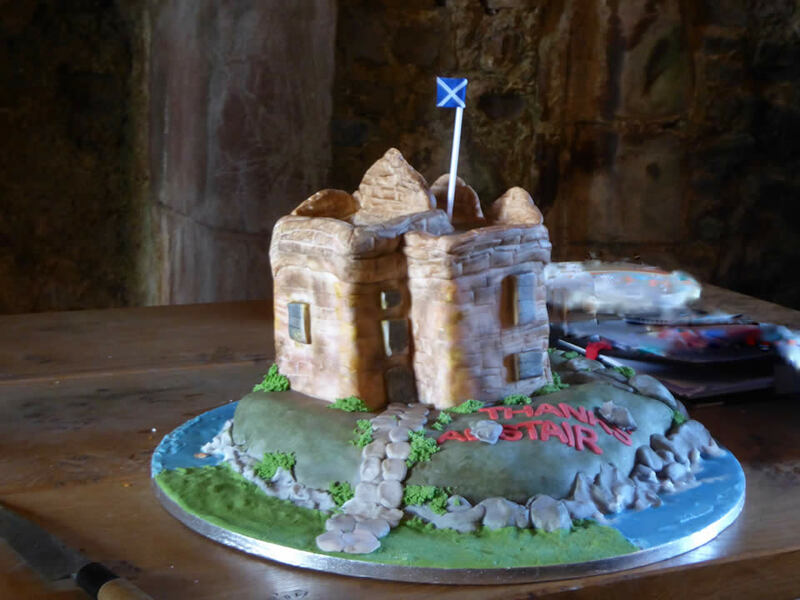 Alastair and his wife Lesley were then presented with a celebratory cake which took the form of a replica of Portencross Castle. The general meeting was followed by a celebratory round of drinks. Note: At its subsequent Board meeting, Mr Sinclair Molloy was appointed as the new chairperson of the Board of Friends of Portencross Castle. The Castle was open daily, 11.00am until 4.00pm, until the end of August, then weekends only (including Monday 19th September) which was the last weekend opening of the season. Occasionally it was closed for a private event: visitors are always asked to check the website before coming. Visitors did not worry about the weather! They enjoyed the shelter on a wild day and looked down on the waves or basked in the sunshine on the roof on a good day and enjoyed the fantastic views. The Portencross Cannon was moved some years ago to a village garden. It has now been returned to its original site outside the Castle. Thanks to all who helped in moving the cannon. The story goes that a ship from the Spanish Armada (1588) sank just off the coast at Portencross. A dive in 1740 resulted in the recovery of a number of cannon, one of which apparently was given to the village as a thank you for assisting. A Spanish crown insignia was visible at one time, but has now been lost to corrosion. The cannon is of Spanish design. In 1982 the Portencross cannon was moved to Hunterston Power station. In 1990, specialists attempted to conserve the cannon. They removed layers of tar, but their efforts failed. The power company returned the cannon to Portencross village in 2003. Some maintenance work will now be carried out to try to reduce further corrosion. 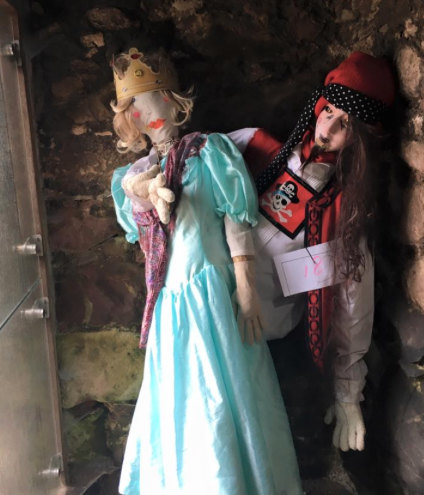 Congratulations to the scarecrows of Portencross Caste who jointly were awarded first prize in the annual Scarecrow Festival. Well done to Audrey Kolon and all who helped. Congratulations to Ken Jarrett who won the raffle at the Art Sale. He chose the framed Pam Glennie print as you can see in the picture. No doubt the print will give Ken many years of pleasure and the usual headache of how best to place it in his home. Also wishing Pam all the best in her new home in Portencross. The Art Exhibition and Sale passed off successfully with 120 paintings hung and 21 sold. The weather was poor on the Sunday which was reflected in a bit of a drop in visitor numbers and sales at the tea tent. However altogether £1,639.40 was raised for the Castle fund, which is very welcome. Thanks to all who came along and to the large number of wonderful volunteer helpers. Special thanks to the artists, who make it all possible. Winning raffle numbers, in order, 1, 57, 129, 257, 72. These were selected by a group of Castle visitors from Indonesia. The winners have been notified. The castle will open over the Easter weekend, 25th-28th March. It takes some time for the castle to warm up after the winter so wrap up warm! The castle will then be open every day between 2nd - 17th April. After this it will open weekends and Holiday Mondays. From 2nd July the castle will be open daily. Opening times are 11-4 with last entry at 3.45pm. Admission is free but we are entirely dependant on donations and fund raising, so all donations are gratefully accepted! Occasionally the castle is closed for a private function. Any such events will be posted on this website. The castle is now closed for the winter and will re-open to visitors at the start of April 2016. We had a total of 7,613 visitors this year. This is slightly up on last year, a remarkable achievement considering the poor weather this summer! The enthusiasm of the visitors was wonderful, and we thank them for their generous donations. Many thanks also to the staff, volunteer guides and all those who helped with other activities such as fund raising events. 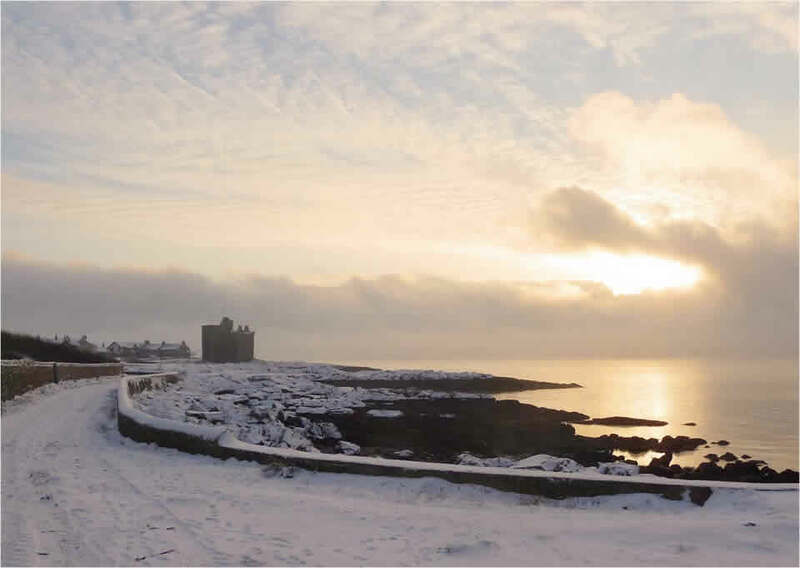 This year's charity Christmas card is 'Snow at Portencross Castle', a photograph by George Crawford. It will be available at the Combined Charities Christmas card sale in West Kilbride Village Hall on the morning of Saturday 24th October, and also from West Kilbride Library, or phone Ann on 01294 823799. The cards are 60p each or 10 for £5. Many thanks to George for allowing us to use his photograph. Many people have been asking about the beautiful boat anchored next to the castle. It is a Viking Wayfarer called Freya. Sometimes called a "Cutter". This is an open clinker boat built in 1969 as a training boat for the Moray Sea School by Duncans of Barry in Orkney. She was moved to Locheil Outward Bound centre when the Moray sea school closed. During her time as a training vessel she was operated soley by sail and oars. On being sold to a private owner in Mull, an engine was installed. She was sold on to another islander before being bought by Andy, a resident of Portencross. He has restored her back to her current fine condition. The castle is now open weekends only (plus holiday Monday 21st September) until the end of Septmeber when it closes for the winter. Opening times remain the same (11-4, last admission 3.45) apart from the afternoon of Sunday 27th Septmember when the Castle will be closed for a wedding. Recent visitors included a group of delegates (shown right) attending the annual European Archaeologists Association conference held this year in Glasgow. The day trip was organised by Historic Scotland to visit 'interesting lowland Scottish Castles' and we were very pleased to be included in this prestigious group (the others were Bothwell, Dean and Dundonald castles). Hopefully we will get a beautiful September but if not, come on a wet and windy day and you can really appreciate the shelter provided by the thick castle walls! A new attraction for visitors to the castle is a short film in which Robert Boyd (son of the builder of the castle) talks about his time at the castle, helping to bring the mediaevel castle to life. 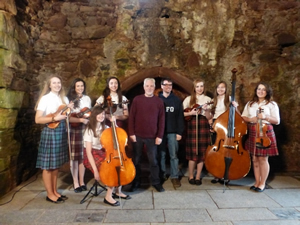 This is accompanied by the Ayrshire Fiddle Orchestra (pictured on the right) playing 'The Flower of Portencross'. Our thanks to all involved in this project, particularly the members of the orchestra and narrator Mark Stephen who gave their time and talent free of charge. FOPC is also grateful to Western Link Community Fund who donated £2,000 towards the costs involved. The castle is now open daily until the end of August (11am-4pm) and then weekends only in September. Entrance is free but donations are appreciated as the castle is operated and maintained entirely by donations and fund raising. The weather behaved reasonably well for the annual exhibition and art sale in the castle. Altogether 114 items were displayed, 20 were sold and 352 visitors attended. The tea tent in South Banks House garden was as popular as ever and altogether, just under £2,000 was raised for Castle funds. There was a raffle of work donated by artists Kris McKinnon, Jane Fraser, Tom Rutherford and Pam Glennie. Winning numbers were drawn by visitors to the castle and first choice went to Davina Kyle (pictured) who selected a pair of Pam Glennie framed prints. This is a very labour intesive event and sincere thanks are due to the many helpers who made it possible. Thanks also to all the visitors and to the support of the artists, without whom it is not possible. Special thanks to Kris, Jane, Tom and Pam for the raffle prizes. 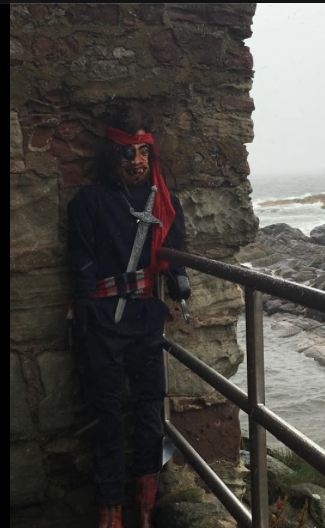 Portencross Castle now relies entirely on fund-raising events such as this, and on individual donations, to keep the Castle open and maintained. Please keep coming! We wish to thank all who participated in making the Annual Music Evening (Ceilidh) on Saturday, 20th June 2015, a success. Over 100 supporters danced the evening away in the South Banks House garden and displayed their musicality on the specially laid dance floor to the music of the MacFadyen sisters. The music was interrupted only by the dancers pausing to replenish their stamina by partaking of the delicious buffet. This fundraiser managed to raise a net total of £1,540.00!! Now, that money has made its way to the Portencross Castle coffers, where it will be used for maintenance and operational costs. To all of you who made this possible...a BIG THANK YOU!!! Largs Rainbows (the group below Brownies in age) recently enjoyed an evening visit to the castle. Dads were brought along as an early Fathers Day treat. A lovely evening was had by all, and we were delighted to receive a donation of £130 which the girls had raised by holding a sponsored scavenger hunt. A big Thank You to all the girls involved in raising the money. In addition to the current weekend openings, the castle will be open from 11am - 4pm (last admission 3.45) on both Monday 4th May and Monday 25th May. The Board and Guardians of Portencross Castle would like to congratulate Audrey Kolon for her recent award of West Kilbride Citizen of the Year. Audrey is a hugely active fund raiser for FOPC and runs many coffee mornings and summer events. She is also secretary of the West Kilbride Civic Society and a keen environmental campaigner. Audrey will be presented with her Rotary Club of Hunterston award at a special dinner this month. The award will include a framed certificate and a cheque for £100 towards a charity of her choice. Well done, Audrey. Justly deserved. Portencross Castle is embarking on an exciting project that will involve making a short film about the history and importance of the castle and surrounding area. The completed film will be the main feature on a new installation for visitors featuring an audio-visual presentation on a wide-screen monitor. Professional actors and film-makers will assist us in this new venture. We hope to have the film completed for our busy summer season. To allow filming to take place, the Castle will be closed on the afternoons of Saturday 11th and Monday 13th April. Thank you for your understanding and we trust you will enjoy the finished product. Everyone had a great training afternoon for existing and new stew ards held at the Barony Centre in West Kilbride (see Craft Town Scotland on Facebook). Alan Hodgkinson gave one of his usual high quality talks on the area. The stewards look forward to welcoming you along with our group of volunteers. They will take you round the castle and explain its history, setting and historical importance. 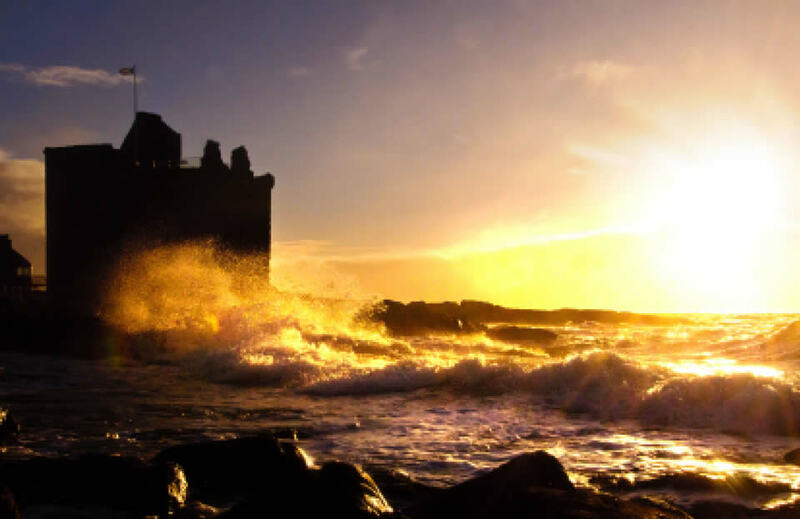 Have a wonderful day out at Portencross Castle! Portencross Castle will open for visitors on Friday 3rd April 2015. It will then be open daily until Sunday 19th April 2015. After this Easter period, the castle will open every weekend, including Monday 4th and Monday 25th May. During the summer period, the castle will open every day from Monday 29th June until Sunday 30th August. In September, the castle will open at weekends including on Monday 21st September. Opening times are 11am-4pm, last entry is 3.45. On occasion, the castle will close for private events. Details of such closures will appear in this News section of the website. At this time of year, we gear up for the opening of the castle. Visitors may see the castle closed and very quiet looking, but behind the scenes, our volunteers, new and returning stewards, and the FOPC Board members are busy getting things ready for the opening. Our stewards refresh or undergo new training; our Board agrees development work for the year; and our volunteers continue to shift around leaflets, spring clean the castle, check lighting and health and safety, and generally get things shipshape for the season. All of this is to continue the high quality experience of our local and far-flung visitors and to continue to develop new experiences for everyone interested in the castle. We hope to welcome returning and new visitors alike this year and trust you have another special day at Portencross. NEW STEWARD REQUIRED for the 2015 season - to join our existing team of four stewards, to share paid duties of working up to two days per week in the summer months, from 11am til 4pm, and weekends from April til September. We are always looking for volunteers to help with the opening of the castle. This includes staffing the castle during opening hours and ensuring that our visitors are well informed and enjoy their visit. Anyone who has a couple of hours a week to spare and thinks they would enjoy being part of the Portencross Castle team is welcome to contact Kay on 01294 823537 or at kayfegan@hotmail.com for further information. The FOPC Board would like to wish all our benefactors, guardians, supporters, staff, volunteers and visitors past and future a very happy Christmas and a wonderful 2015. Opposite is the image on the Portencross Castle Christmas cards courtesy of Peter Ribbeck. You may think that we all go away during the closed season, but members of the Board and supporters are busy planning enhancements to the display and better facilities for staff. We also attend to any maintenance and ongoing challenges posed by the elements generally. All of this is to continue make our visitor experience as high quality as we can possibly manage. We were delighted to receive a model of the castle made out of matchsticks. It was designed and constructed by Jim Miller of Kilwinning (pictured in the middle of the photograph). Around 15,000 matchsticks and 300 lollipop sticks were required and Jim spent three months on the task. He has previously completed more than 90 matchstick models, mostly of churches. 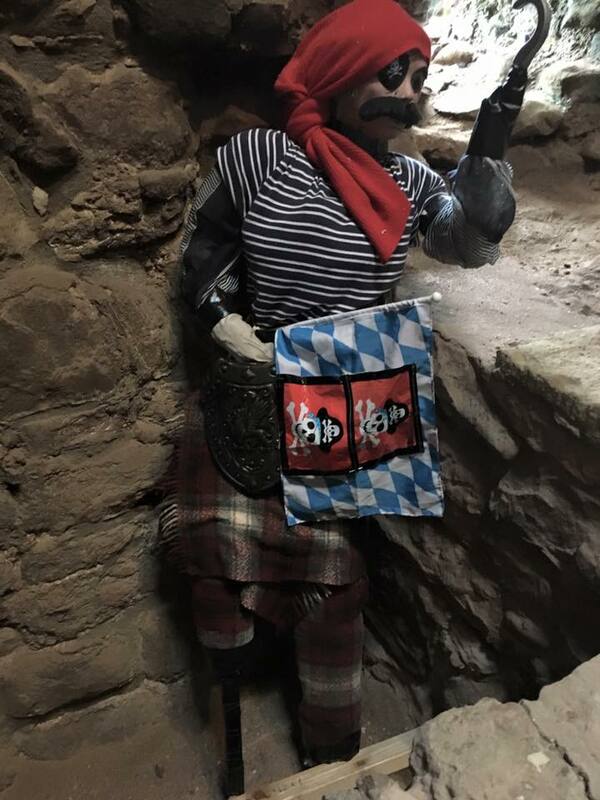 The model is now on display in the Great Hall of the Castle so that all visitors will have the chance to view and admire it. Many thanks to Jim for this beautiful piece of work. Please note, the castle will be closed to the public on the afternoon of Monday 28th July as it has been booked for a private ceremony.